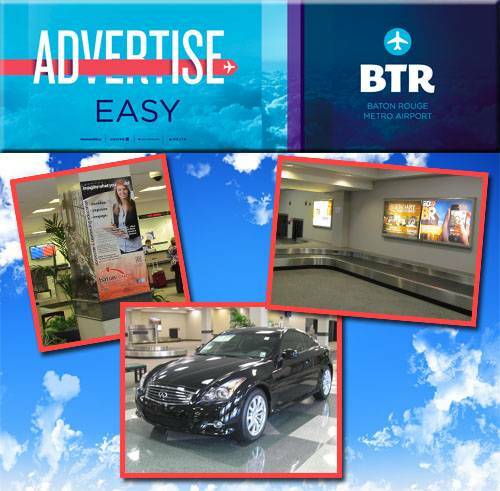 Advertising at the Baton Rouge Metropolitan Airport is an effective way to reach a high-income, highly-educated customer. Nearly 800,000 passengers pass through the airport annually. Tension fabric displays customized to client preferences. Wall-Wraps and clings are installed in areas with heavy passenger traffic and can be directly applied to various surfaces throughout the airport, including walls, windows, columns, and doors. Digital Displays ads that can be interactive with eye-catching motion or static campaigns. Banners visually dominate a space and are strategically placed to provide head-on views and ideal sightlines. Exhibits provide a unique and interactive environment for passengers to learn about, sample and engage with a brand. please contact Clear Channel at (800) 628- 6800 and reference advertising at BTR.